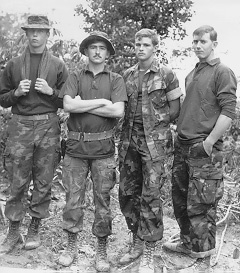 A group shot of four CAP 2-7-2 Marines taken late in 1970. Note the long sleeves, boots, hats and general appearance of cool weather clothing. (Left to right) Roch Thornton, Ken Duncan, Nelson Kilmister and Dennis Prock.